19th April, 2019. Added domains from EN5ider articles. Removed broken links to ENWorld data base subclasses. Most are gone. 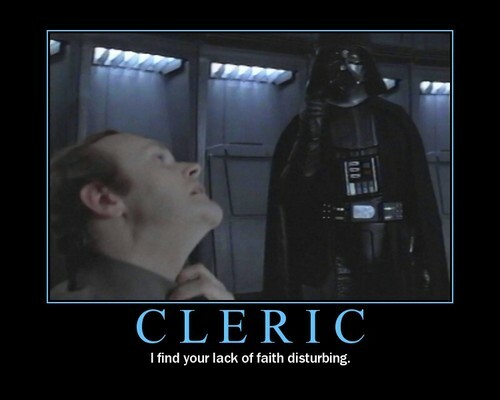 (NB: Clerics can be granted further proficiencies according to their Domain. Any new skills or weapon groups are noted below). Weapon Groups: Clerics gain proficiency in Simple weapons from their proficient groups, however, they gain proficiency with the Martial weapons of 1 of these groups (which should reflect the weapon used by their deity). Choose any 4 weapon groups. Skills: Choose 2 from: History, Insight, Medicine, Persuasion, Religion and Swim. Anarchy (EN5ider article Spiritual Alignment: Chaotic Cleric Domains, by Walt Ciechanowski). Arcana. (Sword Coast Adventurer's Guide p125, Wizards of the Coast). Authority (EN5ider article Spiritual Alignment: Lawful Cleric Domains, by Walk Ciechanowski). Community (EN5ider article Spiritual Alignment: Lawful Cleric Domains, by Walt Ciechanowski). Conformity (EN5ider article Spiritual Alignment: Lawful Cleric Domains, by Walt Ciechanowski). Entropy (EN5ider article Spiritual Alignment: Chaotic Cleric Domains, by Walt Ciechanowski). Flames. (Priests of Elemental Power EN5ider article C. Richard Davies). Forge. (Xanathar's Guide to Everything p18, Wizards of the Coast). Grave. (Xanathar's Guide to Everything p19, Wizards of the Coast). Harmony (EN5ider article Spiritual Alignment: Neutral Cleric Domains, by Walt Ciechanowski). Integrity (EN5ider article Spiritual Alignment: Neutral Cleric Domains, by Walt Ciechanowski). Liberty (EN5ider article Spiritual Alignment: Chaotic Cleric Domains, by Walt Ciechanowski). Misfortune (EN5ider article Priests of Misfortune, by Dan Head). Nature. (PHB p61). Bonus Proficiencies: At 1st level you also gain proficiency with Simple weapons from 2 of the following weapon groups: Axes & Picks; Blowguns; Bows; Clubs & Staffs; Natural Weapons; Spears; Thrown & Slings; Whips, Chains & Nets. Protection. (Arcana Unearthed, Wizards of the Coast). Protection (EN5ider article Volumes of Forgotten Lore: Divine, by Ari Marmell). Shadow (EN5ider article Volumes of Forgotten Lore: Divine, by Ari Marmell). Spirit. (I Ain't Afraid of No Ghost EN5ider article Kiel Chenier). Stone. (Priests of Elemental Power EN5ider article C. Richard Davies). Supremacy (EN5ider article Spiritual Alignment: Neutral Cleric Domains, by Walt Ciechanowski). Travel (EN5ider article Volumes of Forgotten Lore: Divine, by Ari Marmell). Water. (Priests of Elemental Power EN5ider article C. Richard Davies). Winter. (Priests of Elemental Power EN5ider article C. Richard Davies). These have been written for individual deities, but can easily be used as domains for those areas highlighted below, or used to help flesh out other domains. Black Cleric Specialty priest of deity Tchernobog. A combination of Evil and Necromancy. (Gods & Goddesses Jetpack7 publishing, p62). Destruction Specialty priest of deity Batara Kala. A combination of Negative Energy, Curse and Death. (Gods & Goddesses Jetpack7 publishing, p22). Devious Spider Specialty priest of deity Anansi. A combination of Deception, Trickster and Illusion. (Gods & Goddesses Jetpack7 publishing, p14). Elder of Nayenezgani Specialty priest of deity Nayenezgani. A combination of Lightning, Healing and Retribution. (Gods & Goddesses Jetpack7 publishing, p50). Elegunshango Specialty priest of deity Shango. A combination of Storms, Presence and Vigor. (Gods & Goddesses Jetpack7 publishing, p30). Inti-Churi Specialty priest of deity Inti. A combination of Sun, Nature and Light. (Gods & Goddesses Jetpack7 publishing, p38). Natural Law Specialty priest of deity Ishtar. A combination of Light and Protection of the Common People. (Gods & Goddesses Jetpack7 publishing, p42). Priestess of Hekate Specialty priest of deity Hekate. A combination of Selfishness, Survival and Darkness. (Gods & Goddesses Jetpack7 publishing, p34). Seeker of Mazu Specialty priest of deity Mazu. A combination of The Sea and Protection. (Gods & Goddesses Jetpack7 publishing, p26). Sorayama Specialty priest of deity Fuji. A combination of Volcano, Fire and Earth. (Gods & Goddesses Jetpack7 publishing, p30). Spaekona Specialty priest of deity Freyja. A combination of Healing, Nature and Protection. (Gods & Goddesses Jetpack7 publishing, p26). Vipra Specialty priest of deity Shiva. A combination of Divination, Fiend-Foe and Abjuration/Anti-Magic. (Gods & Goddesses Jetpack7 publishing, p30). The Wise Specialty priest of deity Baba Yaga. A combination of Elements, Nature and Wisdom. (Gods & Goddesses Jetpack7 publishing, p18). Clerics can have spell lists with the following number of spells: 12 for spell levels 1-3; 8 for spell levels 4-6; 4 for spell levels 7-9. (Spells gained from other means, such as domains, do not count towards these limits).